Sadie is a single mum, nursing a broken heart. Her best friend from childhood, Cat, is burned out from working long hours as a chef in Paris. In need of a change, they decide to invest in their dream – running their own handmade biscuit shop in gorgeous Castle Court, a three-storey food court tucked away behind Chester's bustling streets. 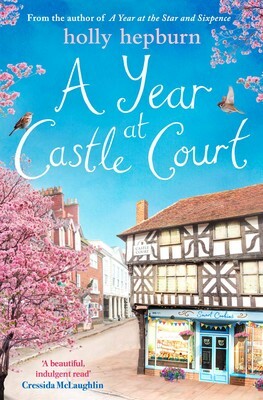 I have just finished one of my favourite books of this year, A Year at Castle Court by Holly Hepburn. This was one of those books that each time you have to put it down you are longing to return to the pages to see what lays ahead for the characters next. Best friends Sadie and Cat have both recently been through a significantly bad time in their lives and are about to embark on a new adventure together opening their own biscuit shop Smart Cookies located in the idyllic setting in Castle Court in Chester. The storyline is full of ups and downs as challenges in both business and the women’s personal lives are sent to try test them. I take my hat off to them both as the amount of problems they both faced would make me crumble but having each other as well as the community support from the other shop owners of Castle Court sure helped the women in their times of need. I instantly warmed to both Cat and Sadie as our main characters and I was routing for them and their business to thrive. I loved the supporting characters in this book too they really helped to shape the storyline from the sweet but strong minded little Lissy and her lover of dinosaurs to the friendly and supportive Earl and Andrew and not forgetting the loveable Adam and Jaren. I loved watching the business grow and my mouth watered from the descriptions of the delights on offer not just in Smart Cookies but also from the other businesses from the Dutch pancakes to the chocolate delights. The author has clearly done her research for this book not just for the biscuit making but also for the facts on Adams bees. Holly Hepburn has created such a sweet and addictive storyline that touches on some delicate issues and then wraps us up in friendship and romance. The writing style is so easy to follow and she creates such an energetic buzz to the storyline and manages to describe things so vividly I almost felt as though I was there at Castle Court surrounded by the old buildings. I absolutely loved this book and I am pleased that my last book of the year was one of the best. I can’t wait to read more books by Holly Hepburn and I will definitely be recommending this one.